The number of multiracial Americans is growing nationwide, but in Hawaii, it’s nothing new. The Rainbow State – with its history of attracting immigrants from Asia and other parts of the world to work as farm laborers – stands far above the rest, with nearly one-in-four residents (24%) identifying as multiracial, according to a Pew Research Center analysis of Census Bureau data. The next most-multiracial states are far behind: Alaska (8%) and Oklahoma (7%). Here’s another way to look at how much Hawaii stands out: In terms of total population, Hawaii is one of the smallest (1.4 million people), ranking 40th out of 50 states. But when ranking states with the highest total multiracial population, the state ranks sixth, with more than 330,000. A new Pew Research survey found that the number of multiracial Americans may be higher than the estimates from Census, which has estimated that 3% of the overall U.S. population – and 2.1% of the adult population – is multiracial. But taking into account how adults describe their own race as well as the racial backgrounds of their parents and grandparents – which the census does not do – Pew Research estimates that 6.9% of the U.S. adult population could be considered multiracial. In Hawaii, the vast majority (70%) of multiracial residents say they are some combination of white, Asian and Native Hawaiian/Pacific Islander. For example, the largest biracial groups in Hawaii are white and Asian (18%), Asian and Native Hawaiian/Pacific Islander (18%), and white and Native Hawaiian/Pacific Islander (12%). 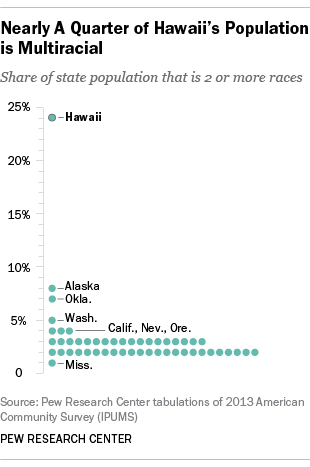 Interestingly, Hawaii is the only state to have a tri-racial group as its largest multiracial group, one that includes white, Asian and Native Hawaiian/Pacific Islander (22%). There is also wide diversity within the Asian race subgroup, with people claiming roots in China, Japan and the Philippines – nations from which immigrants arrived with the growth of the sugar cane industry in the mid-1800s. 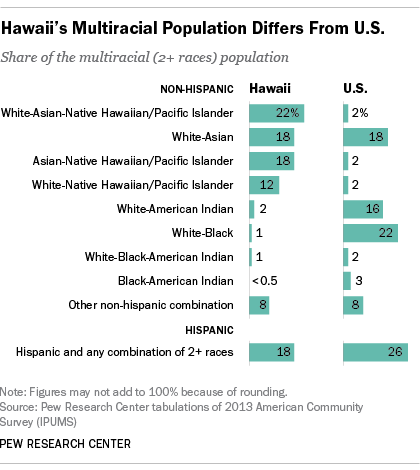 Hawaii’s abundance of multiracial people with Asian and Native Hawaiian/Pacific Islander heritage differs from the makeup of the nation’s overall multiracial population (including adults and children). In the U.S., the multiracial population is more evenly spread among biracial white and black (22%), white and Asian (18%) and white and American Indian (16%). The states where biracial white and American Indian is the majority of a state’s multiracial population include Oklahoma (61%) and Maine (53%). Under the Census Bureau’s narrower definition of multiracial, biracial white and black is the biggest group. Accordingly, biracial white and black is the biggest multiracial population in 29 states. The states with the highest share of biracial white and black include Ohio (47%), Kentucky (46%) and Indiana (42%).